Show your active Smart Prepaid, Postpaid and Smart Bro SIM at Ticketnet outlets until December 31. [16 December 2016] Smart continues to bring the ultimate music experience to subscribers as it gives all prepaid, postpaid and Smart Bro users an exclusive 20 percent discount on the Manila leg of David Guetta – Unity Tour at the Smart-Araneta Coliseum on January 5, 2017. To enjoy the discount, simply present your active Smart SIM at Ticketnet outlets nationwide upon buying your ticket until December 31. Watch out as Smart is also set to give away free tickets plus updates via its social accounts on Facebook (www.facebook.com/SmartCommunications) and Twitter (@LiveSmart). This treat is part of Smart Music Live, which allows the mobile leader to dish out an unrivaled music experience for all subscribers – from streaming their music on the go, enjoying exclusive content and updates on their concert, to watching them perform live and meeting them in the flesh. Shaping up to be the most explosive concert party to welcome 2017, David Guetta’s - Unity Tour in Manila will feature the world's biggest DJ spinning his worldwide smash hits with massive projections, LED screens, strobes and effects for an unforgettable immersive audio and visual experience. Guetta’s long list of hits include “Titanium (featuring Sia), “When Love Takes Over” (featuring Kelly Rowland), “This One’s For You" (featuring Zara Larsson), “Hey Mama” (featuring Nicki Minaj, Bebe Rexha and Afrojack), and “Bang My Head” (featuring Sia and Fetty Wap), among many others. The French superstar DJ has also collaborated with some of the world’s biggest artists like Madonna, Britney Spears, Rihanna, Lady Gaga, Chris Brown, Avicii, The Black Eyed Peas, and many more. 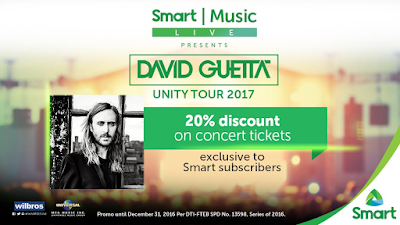 David Guetta – Unity Tour is co-presented by Smart in partnership with Wilbros Live. The concert adds to list of hosted by Smart Music Live. Prior to David Guetta, Smart also brought the ultimate music experience for subscribers at the much celebrated concerts of Selena Gomez, The Vamps, The 1975, Third Eye Blind and Panic! At The Disco + James Bay, Elle King, Twin Pines, Nathan Sykes, Greyson Chance and Ely Buendia. For the latest updates on Smart Music Live’s awesome offers and music experiences, follow Smart’s official accounts on Facebook, Twitter and Instagram.